100 times stronger than Duct Tape. The solution for breaks, tears and cracks. When cured Fiberfix is as strong as steel and gives a durable and dependable repair. Ideal for fixing tools, pipes, and repair works. 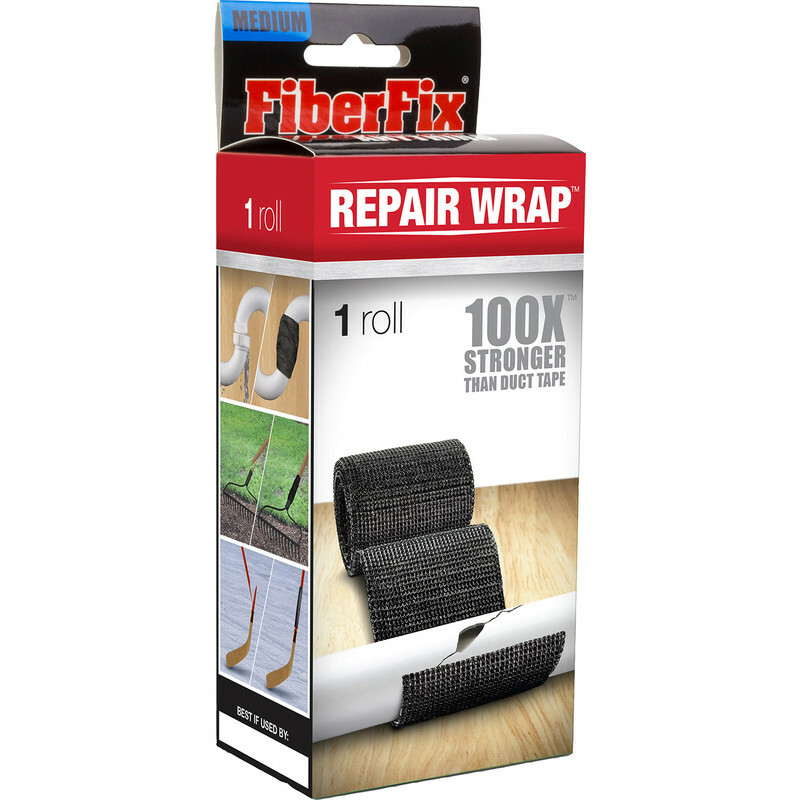 Fiberfix Repair Wrap 5.0 x 127cm is rated 3.1 out of 5 by 9. Rated 1 out of 5 by Fix it soon from RUBBISH Brought this and found it didn't work didn't even stick. Rated 3 out of 5 by Johnny61 from Didn't do the job unfortunately Bought to repair a copper waterpipe but didn't seal the leak. Seems to be porous. May be our fault in application. Rated 2 out of 5 by Woodharts from Disappointing Bought this to fix a leaking underground garden water pipe. Was annoying to discover that once opened all the tape had to be used there and then - you can't keep some for later. Over 3 foot of tape for a job on a 1 inch pipe. If I'd known I wouldn't have bought it - it was comparatively expensive but I thought it would be handy to have around for future emergencies if it was as good as it claimed. Sadly, although I followed the instructions exactly it didn't work - leaked through although I couldn't see why or how - it should have worked and didn't. Rated 1 out of 5 by Harvey169 from didn't work Bought it to fix a leaking pipe, followed the instructions but pipe still leaking. Rated 1 out of 5 by TJ the mender from Sounded ideal but Be aware - sounded great, just the job I thought however following delivery I then read the additional information on the makers website - this wrap has to be all used immediately once opened as the curing process is activated on exposure to air and moisture in the air triggers chemical activation. According to the makers website this wrap cannot be partially used and stored for later usage. Toolstation were very understanding and appear to be disadvantaged by lack of makers critical info on Toolstation website. Toolstation gave an immediate refund no fuss - well dealt with. Rated 5 out of 5 by Slipper from Great product I bought the to repair a metal pole of a garden spinner that was not broken but it was warped with the weather. I did it on one of our few dry days and left it for 24 hours to make sure it stuck,and next day even though it was raining it was stuck solid I t is sill solid after a week so I'm very pleased.